UBA7 antibody LS-C10939 is an unconjugated rabbit polyclonal antibody to human UBA7 (UBE1L). Validated for ELISA, IHC and WB. UBE1L / UBA7 antibody was raised against synthetic peptide corresponding to aa 222-240 (D222CDPRSIHVREDGSLEIGD240) of N-terminal human UBE1L. Percent identity by BLAST analysis: Human, Gorilla, Gibbon, Monkey (100%); Marmoset (95%). Western Blot. 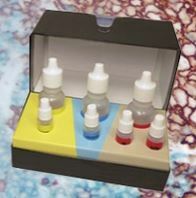 Applications: Suitable for use in ELISA, Immunohistochemistry, Western Blot. ELISA (direct and indirect): 1:5000-1:10000). Western Blot: 1:5000-1:10000 using ECL. Suggested blocking and dilution buffer is TBST with 0.05% Tween 20 with 5% skim milk. Suggested incubation time is 1 hour at RT). Immunohistochemistry: Frozen, paraffin sections. Raw antiserum. Contains no preservatives.